The commo n ingredient throughout all three courses for this Supper Club was a 12 year old Malt Whisky! Diners were offered a shot of the Malt at the start of the evening, and continued to enjoy the smooth, rich taste of this Scottish Speyside Single Malt Whisky, produced by Strathisla – Strathisla 12 Year Old Scotch Malt Whisky 70 cl – Strathisla is the oldest distillery in the Highlands of Scotland. The three courses, together contained almost two 70cl bottles to serve 9-10 people, making it quite an expensive meal to produce, but well worth it! The first course was Whisky and Chilli Tiger Prawns, coated with a sweet whisky and chilli glaze, baked in the oven and topped with a little finely slivered lime zest. The main course consisted of a whole roast fillet of beef, cooked to medium rare, cut into steak medallions, dressed with a whisky, grain mustard and cream sauce and served with crispy potatoes and roasted mushrooms. Recipe here. Dessert was an all time favourite of mine …. marmalade and whisky bread and butter pudding. Served with fresh oranges marinated in Whisky and sugar syrup making the dessert sublime! 1. First make the cream sauce: Heat the butter and oil in a heavy based frying pan and add the shallots, stirring occasionally until just lightly golden. 2. Add the whisky, bring to the boil and cook briskly until reduced to about two-thirds. 3. Add in the grain mustard, brown sugar and double cream. Simmer the whisky sauce until thick enough to coat the back of a spoon. Season with salt and pepper and set aside until required. 4. Drizzle a little olive oil over the fillet of beef and season with salt and pepper. Roast in a pre-heated oven at 200 degrees C for approximately 25 minutes. The fillets needs to reach a temperature of 63-65 degrees C for medium rare, 70 degrees for med and approx 75-77 degrees C for well done (I used a probe to check). Leave to rest for approximately 10 mins and then slice into thick steaks. 5. 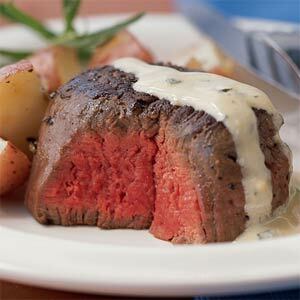 Reheat the cream sauce and drizzle over and/or around the steaks. 3. Stir in the finely grated lime zest, then remove the pan from the heat and set aside. 4. 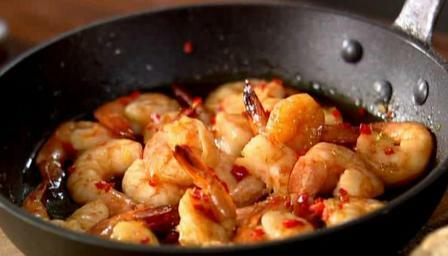 Put the prawns in a shallow ovenproof dish and sprinkle over the chilli. Brush the prawns with the oil and then with the glaze. Bake in the oven for 10–15 minutes, or until the prawns turn opaque. Remove from the oven and brush with more glaze, reserving any extra glaze for dipping, and set aside to cool slightly before serving. 1. Lightly sautee the onions and garlic until translucent but not coloured. Leave to cool. 2. In a large bowl mix together the mince, onions, garlic, tomato ketchup, mustard, egg, and chilli. 3. Dive in with your hands and mix until the ingredients are well blended. Either shape into patties or to get each the same size, push into ring moulds approximately 9 cm in diameter. I like to make my burgers quite thick as they shrink in cooking, but if you want to extend to 8 then make them a little thinner. 4. Get a griddle pan and heat on a high heat. Slide a little olive oil on each side of the burgers with your fingertips or a pastry brush and then making sure the pan is really hot, griddle for a minute or two on each side to get a good colour. 5. Finish off in a medium hot oven (200 degrees C or Mk 6) for about 10-15 minutes (depending on thickness). 6. 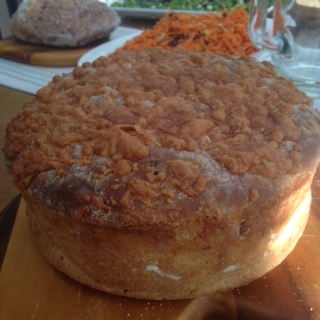 Serve with brioche buns (I got mine from Ocado – much better than Waitrose or Heston’s) and some salads. Fabulous dining guests lingered around the wrought iron table set for our BBQ meal on Saturday’s “A Taste of Fire” Supper Club event, which was held at a venue in Wraysbury. 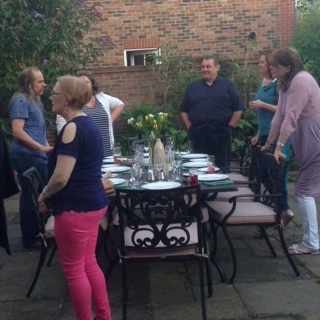 This was my sixth meet up since starting the Supper Club and some of my diners were already old friends – regulars who had already attended more than one of the Supper Clubs that have been going now since February of this year. Dessert: Tropical Fruit Salad in a Rum Sugar Syrup served with Chantilly Cream. The evening kicked off with a Raspberry Summer Punch, which was enthusiastically received by all – a mix of wine, cranberry juice, raspberries, mint & lemonade over ice. As I was cooking for 10, I decided it might be prudent to cook or part-cook some of the meat in the oven, to receive a final kiss on the BBQ griddle bars, before being served with an array of sides and home made breads, the most popular of which was the cheese and pancetta bread pictured above. I was particularly pleased with my home made gourmet burgers, to which I added to the leanest beef mince I could get, some sautéed onions, garlic, chillies, tomato ketchup and Dijon mustard. These delicious beef patties were sandwiched between soft, sweet brioche buns (the only food that wasn’t home made – unfortunately, I had no time) and I chose to squeeze some guacamole inside of my own, which made it even more unctuous ! There was plenty of food to accommodate second helpings …. and even some left over for a quick, light lunch on Sunday!